The Dow punched through 15,000, a new milestone, before pulling back to close at 14,973.96 on the news that U.S. employers added 165,000 jobs in April, knocking the unemployment rate down to 7.5 percent, a four-year low. Veterans look at job openings at the University of Southern California booth during a jobs fair for veterans in Los Angeles. After weeks of conflicting signals about the strength of the economy, a big gain in the jobs market gave Wall Street reason to celebrate Friday. The stock market surged, traders donned party hats, and the wave of buying drove three indexes through major milestones. "There's euphoria today," said Stephen Carl, the head equity trader at The Williams Capital Group. "That's what you'd have to call it." The Dow Jones industrial average punched through another milestone, 15,000, before easing back. The Standard and Poor's 500 index closed above 1,600 for the first time. For more U.S. news and business coverage, visit NBCNews.com. The Dow rose 142.38 points to close at 14,973.96, up 1 percent. The S&P 500 index surged 16.83 points, or 1 percent, to 1,614.42. A surprisingly strong job report set it all off. U.S. employers added 165,000 new workers in April and many more in February and March than previously estimated. 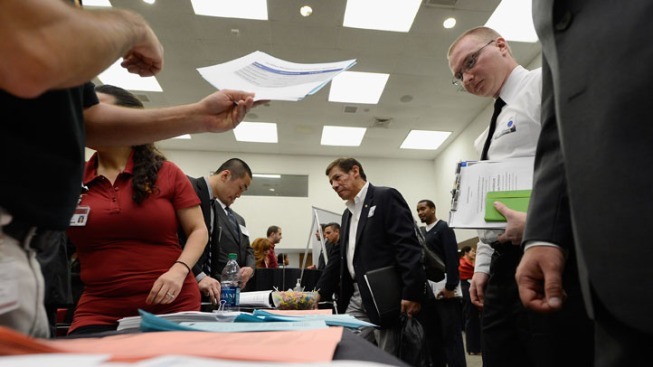 The unemployment rate fell to the lowest level in four years, 7.5 percent. The surge in U.S. hiring comes after weeks of conflicting signals about the strength of the global economy. The unexpectedly strong numbers jolted markets higher from the start of trading. On the floor of the New York Stock Exchange, brokers sported baseball caps emblazoned with "Dow 15,000." The gains were broad. Eight of the 10 industry groups in the S&P 500 index rose. Nearly three stocks rose for every one that fell on the NYSE. Companies that stand to benefit most from an upturn in the economy led the stock market up. Those that make basic materials and produce oil and gas rose the most in the S&P 500 index. U.S. Steel, General Electric and Dow Chemical were among the winners. Utilities, consumer-staple companies and other safe-play stocks trailed the market as investors took on more risk. Small-company stocks are more risky than bigger companies but can also offer investors greater returns. On Friday, they outpaced the broader market. The Russell 2000 jumped 14.57 points, or 1.6 percent, to 954.42, a new all-time high. The Nasdaq composite index rose 38.01 points to 3,378.63, an increase of 1.1 percent. "We're breaking through psychological barriers and that will continue to bring investors off the sidelines," said Darrell Cronk, regional chief investment officer for Wells Fargo Private Bank. He called the jobs news "wonderful." For more than a month, investors have had to wrestle with worrying reports on the world economy. First came news of falling retail sales in March, then a series of weak manufacturing reports and signs of an economic slowdown in China. The first-quarter earnings season has been mixed, too. Though earnings have been higher than expected, many companies have reported little or no revenue growth, which has spooked investors. Investors have also been concerned that higher Social Security payroll taxes and sweeping government spending cuts that took effect earlier this year will slow U.S. economic growth, and pinch corporate profits. Friday's jobs numbers suggested the private sector might be strong enough to overcome those various obstacles. In its report, the government revised its previous estimate of job gains up to 332,000 in February and 138,000 in March. The economy has created an average of 208,000 jobs a month from November through April — above the 138,000 added in the previous six months. "Jobs are key," said Randall Warren, chief investment officer of Warren Financial Service in Exton, Penn. "Everyone is worried about things like fiscal policy, the government spending money it doesn't have. If you want to turn that situation around, you have to get people off their couches." Stock overseas rose on U.S. jobs report, too. The main indexes in France, Germany, Spain and Brazil rose 1 percent or better. The S&P 500 is up 13 percent from the start of the year. The Dow is up 14 percent. Many investors struck a skeptical note. Tim Biggam, chief market strategist at the brokerage TradingBlock in Chicago, said he thought the market was being driven higher by people hoping that the Federal Reserve's efforts to help the economy will keep working. Biggam said they're ignoring troublesome trends. Slower sales mean companies have turned to more cost cutting to push their profits up. And other economic reports, including two out Friday, have pointed to a slowdown. Factory orders sank in March and gauge of growth in the service sector fell short of estimates. "This may be the time you want to avoid getting in the market in my opinion, rather than jump in," Biggam said. The yield on the benchmark 10-year Treasury note jumped from its lowest level of the year, as traders moved money out of the safety of government bonds. The yield rose to 1.74 percent from 1.63 percent late Thursday. — Gilead Sciences jumped $2.97 to $55.15, a gain of 6 percent, one of the biggest gains in the S&P 500 index. The maker of HIV drugs reported a 63 percent surge in income in the first quarter thanks to lower costs and increased sales. — Kraft Foods rose $2.58 to $53.11, an increase of 5 percent. The food maker reported first-quarter income and revenue that beat the forecasts of Wall Street analysts as it increased sales and cut costs following its split from its global snack business. — LinkedIn, the professional networking social media site, sank 13 percent, losing $26.08, to $175.59. The company issued a revenue forecast for the rest of the year that was well below what financial analysts were expecting. LinkedIn went public in May 2011 at $45 a share.